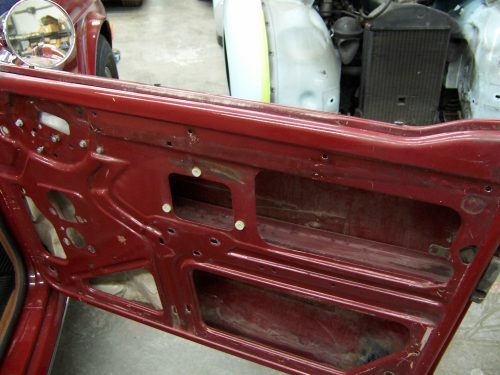 Triumph TR4 thru TR6 door rebuilding from a bare shell is much easier if the various steps are done in a logical manner. The purpose of this post is to illustrate the steps, in the order that makes assembly the easiest. 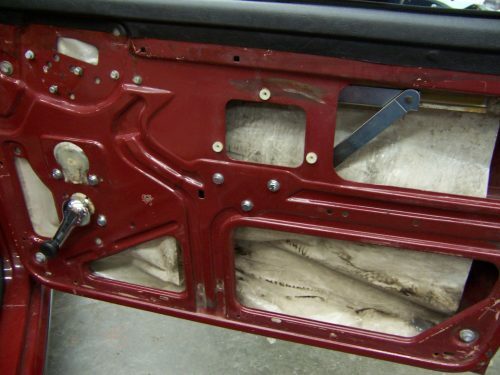 TR6 (late) RH door shell. First step depicted is the door structure with the outer handle, lock, and door latch already installed. Trim the new upper door crash pad as nec’y. There is always extra material on both ends, as well as the inside flange under the inner fuzzy seal. Trim this area to the bottom of the flange. Locate position with tape as pictured. 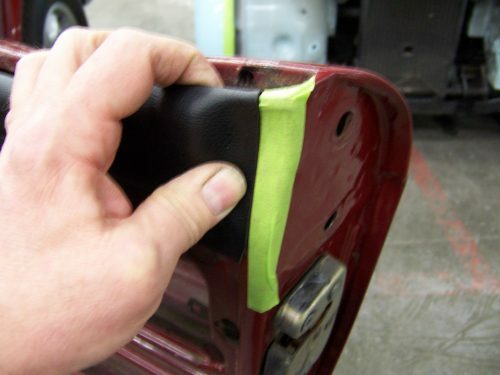 Once the contact cement is brushed on, there is no fore and aft movement of the pad. It’s initial position is important. Glue the inner seal flange first, then after that sets up, glue the material beneath the door panel. It is not necessary to glue the entire contact surface as it makes it nearly impossible to make minor location corrections. Install the door glass channels next, locating the rain shield, if still present, before bolting up the forward channel. Leave the rear channel loose with no fasteners at the top end, and all other fixing bolts loose. You will see why later. 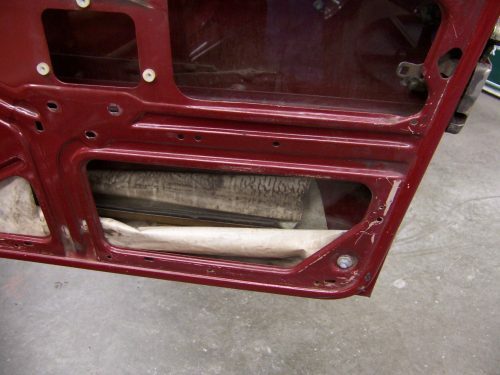 Install the door glass sliding it down into the channels, and leave it resting on the bottom of the door. This leaves ample space to install the upper inner and outer door glass seals. With the seals installed, it is very difficult to install the glass without damaging the seals. Install the inner fuzzy seal clips on the flange with a hook tool as shown. Space the seven clips equally. Be careful not to dislodge or wrinkle the crash pad on the flange when installing the clips. 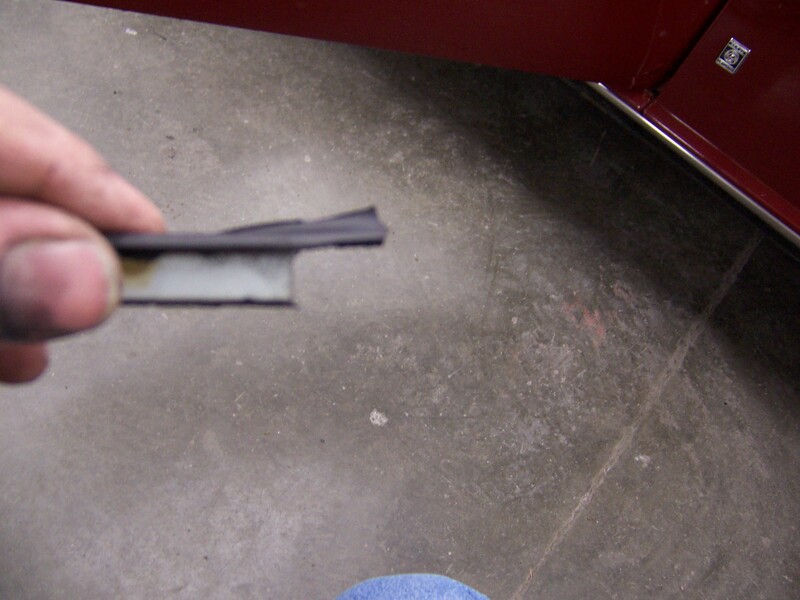 If the contact cement is fully dried, the crash pad should not roll up under the clip. Note that the clip pictured is rearmost, and is installed as far aft as the door skin allows. Install the inner fuzzy seal into the clips. Support the bottom of the clip with your hook tool, and snap the seal onto the clip. Be careful to match the contour of the door with the seal as pictured. Shot of top of door, with crash pad and inner seal installed. 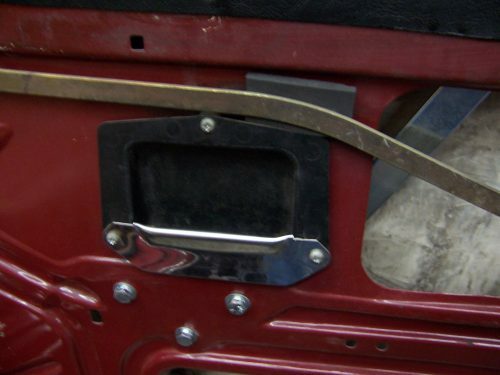 Fit up the outer glass seal to the door to match contour, and trim the excess metal material from forward edge as shown so it fits into the glass opening. It is always too long at the forward edge. Leave the upper rubber in place for now. Trim that back after the seal is installed for a neat, uniform appearance. Fit up the outer seal into the opening after laying a piece of tape on the upper door skin as pictured. Make a mark on the tape to reference the location of the clips on the door seal in relation to their place on the flange. Install the seven clips in those locations on the flange, then install the outer seal into the clips already correctly located in the same manner as the inner fuzzy seal, pressing the seal down firmly onto the clips whilst supporting the clip with the hook tool. Make sure the contour of the seal matches the upper door skin. The outer seal is more difficult to install than the inner. Just make sure the seal is fully seated along the upper door skin, and the retaining clips pulled up onto the seal fully. 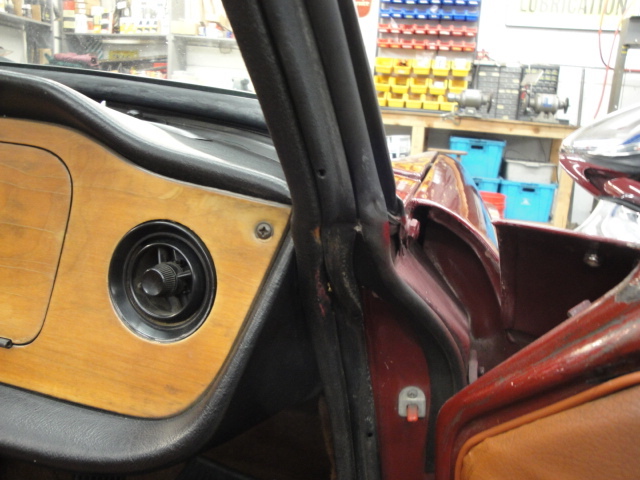 The door with both inner and outer door glass seals installed. Very neat and clean in appearance. You can now see why I install the door glass into the door first. The door glass will not drop down into the door with both seals installed, and the seal clips are difficult to install with the door glass fixed to the regulator. 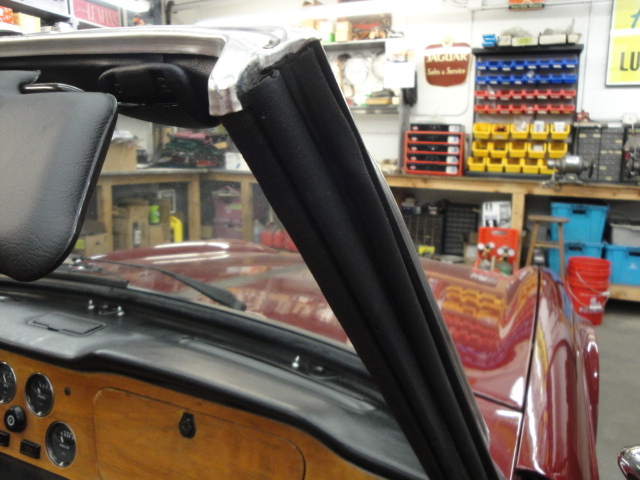 Now install the upper fixing bolts on the rear glass channel. You can see the rearmost outer seal clip is trapped by the channel, and difficult to install if the channel is bolted up tight prior to installing the clips.. Install the regulator into the door after propping the glass up out of the way, locating the fixing bolts thru the rain shield. It is much easier to install the regulator onto the glass and onto the inner door if you crank the regulator around to match the geometry of it’s normal installed position before trying to engage the regulator arms onto the glass channel. The late TR6 doors with the inner strengthening channel really restricts the space, but is much easier if the geometry is right first. Install the lower window stop bracket engaging the wire ends around the lower glass channels. Lower the glass to check bottom travel, then fix the stop. Find a not too snug spot in locating the lower fore and aft location of the glass channels to allow free movement of the glass. Not too tight, not too loose, then fix the lower channel bolts. Install the door remote as pictured. 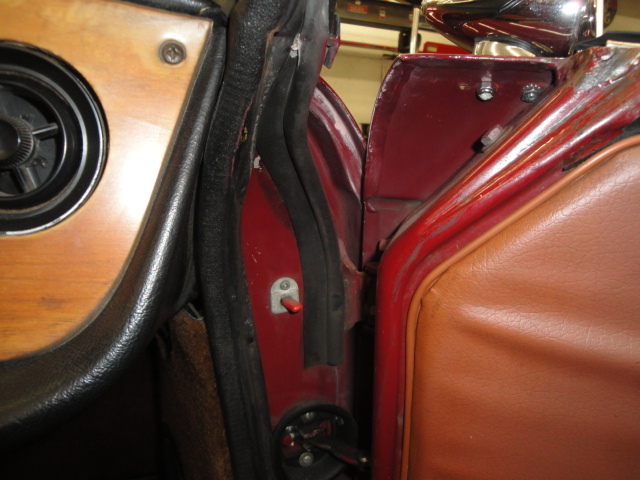 Note the anti-rattle pad glued to the inside door under the remote link. The factory used underfelt type material. 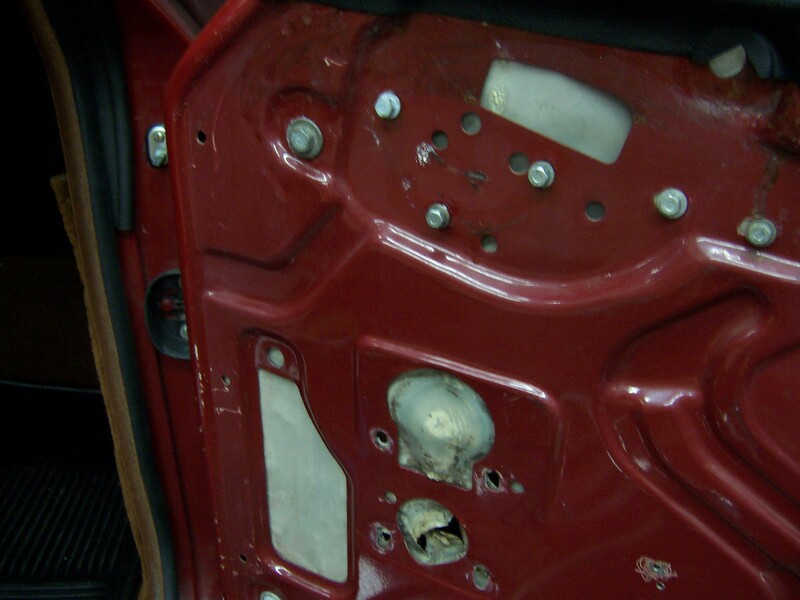 This car was missing the original pads, so a dense cell foam strip was trimmed and glued into place. Shazzam. Door assembly complete with the exception of inner handles. (The inner door handle installation warrant another complete procedure). Do not feel bad if a door takes you all day and your hands and lower arms are bleeding from several places. A full door rebuild takes me over 3 hours each side, and I have rebuilt many TR doors. This entry was posted on Saturday, May 22nd, 2010 at 5:23 pm	and is filed under Tips and tricks. You can follow any responses to this entry through the RSS 2.0 feed. Both comments and pings are currently closed. Nice article I am rebuilding my doors and have one dooe glass that will not stay in the bottom bracket. Is the glass glued in or is it just supposed to fit in the channel tightly. If so I guess I need a new piece of rubber. If the rubber is OK but merely detached from the glass and channel, you can clean things up and reassemble using 3M Structural Adhesive. 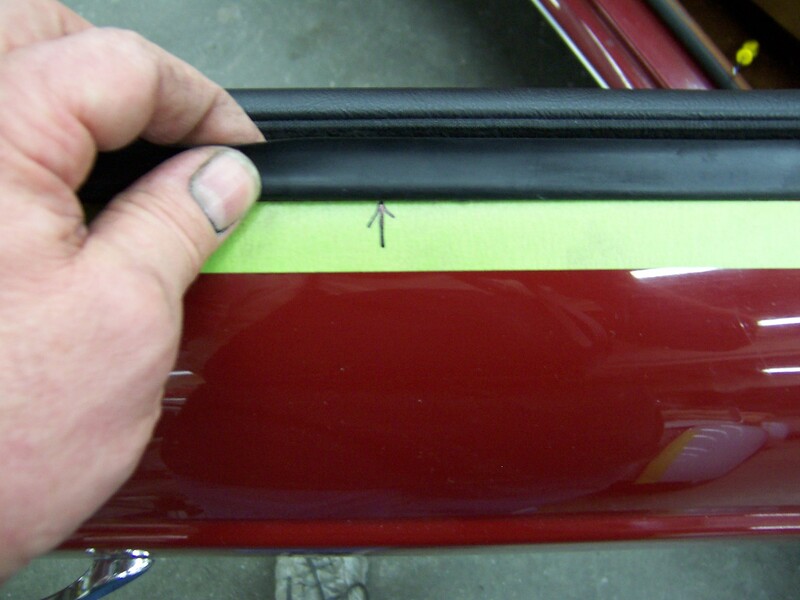 Be sure you locate the glass in it’s correct location fore and aft before gluing!! Helpful article, thanks for posting. 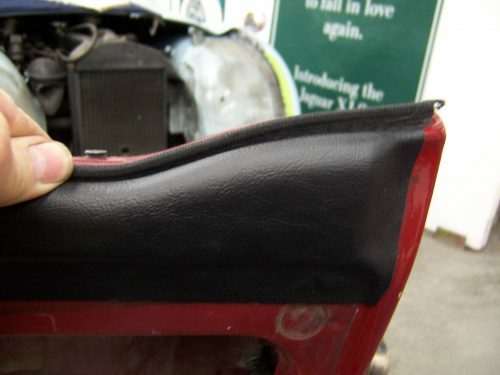 Can you tell me where to find the rain shields to fit a 1970 TR6? Best explanation I have seen. Clips I bought from Moss were identified wrong. Inside and outside were reversed. Removing locks was a challenge and I eventually resorted (with restraint) to a wood block and hammer. I bought the improved retainer kit and they worked well, altough re-installing the locks with original retainers looks like it would have been easy. Thanks for posting this. Photos were great! Thank you for your kind comments. I usually pry off the old lock clips with a pointy tool and discard, then fit up MGB style lock retainers (Moss #402-195). Very easy installation. Thanks for this – made planning the work a lot easier and avoids all the mistakes that would be made when I build the units this year – I have not attempted this work before – looking for TR6 – 1973 door catches if anyone can help? Great pictures! I am almost finished restoring a Java Green 76 TR6. I need to see a picture of the two rubber strips that go up the windshield and seal against the door glass. Hi Mark, I am also rebuilding my doors and windscreen and your article is great. Would you mind sending me those photos of the windscreen frame seal setup as well. 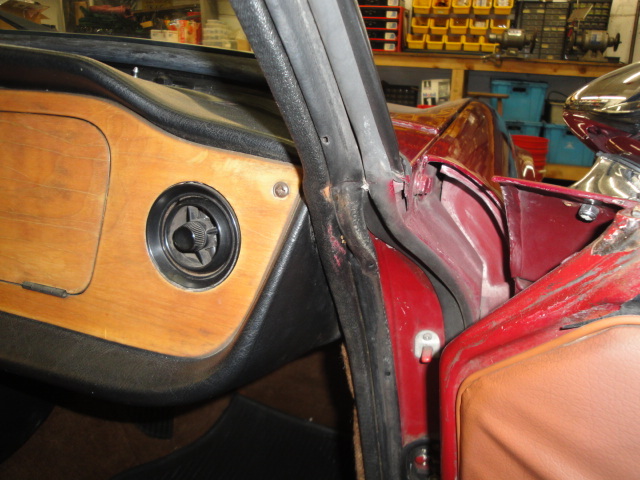 I just came across your article, as i am restoring a 1970 TR6, and just getting to the doors. My right window is off its bottom bracket. I have cleaned the bracket, and now need to secure the window base to the bracket. There is no rubber left in the bracket; just clean metal. Can you recommend how to secure the window base to the bottom bracket? 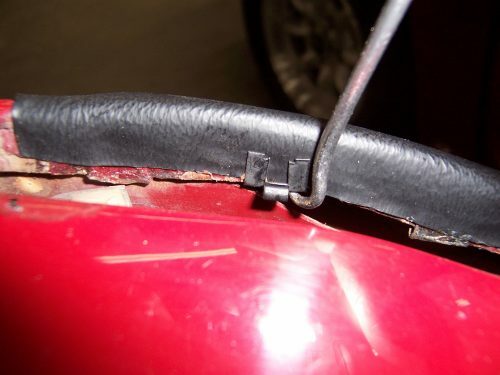 Do i need a rubber strip and adhesive? Thanks! Yes..the procedure is basically the same from TR4 thru late TR6. 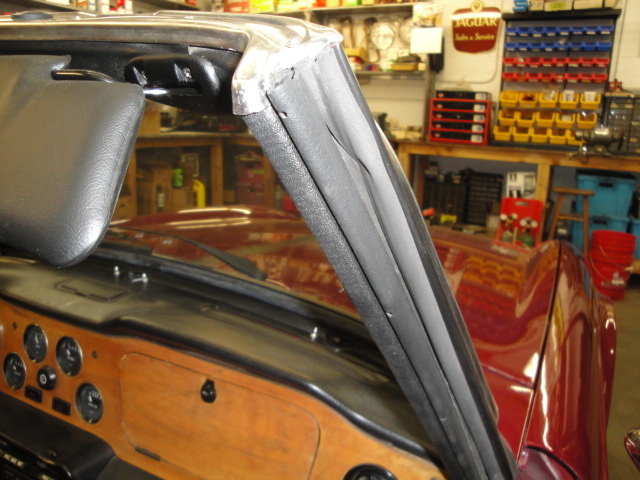 Hi Mark, I am in the process of rebuilding my doors and windscreen and your article is great. Would you mind sending me photos of the windscreen frame seal location and setup as well? 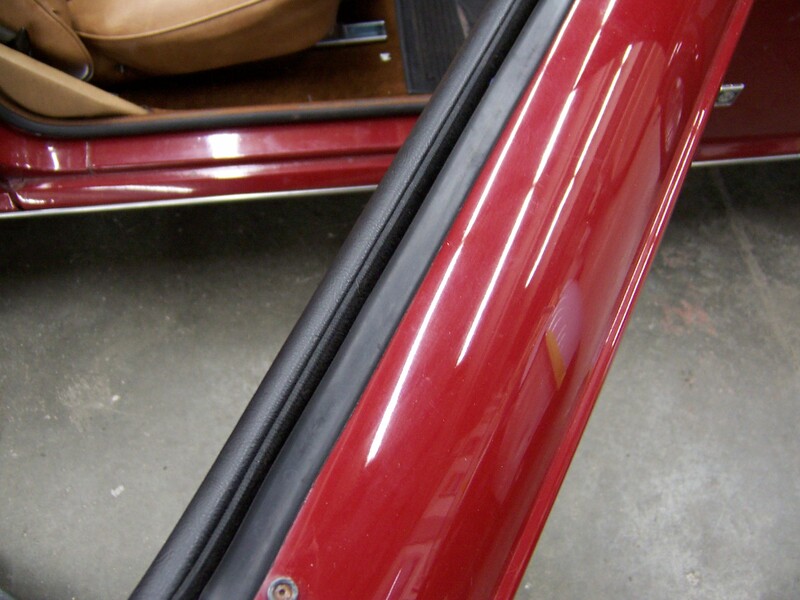 These are the strips “door glass seal” that go on the windscreen and inner fender. the front of the window glass seals on them. I have no old ones to reference. Might I get a set of those same photos also? The ones which show the A-pillar seals in position from the top of the windscreen and travelling downward towards the floor of the car? How far down does the rubber “P” seal travel and what is its path? 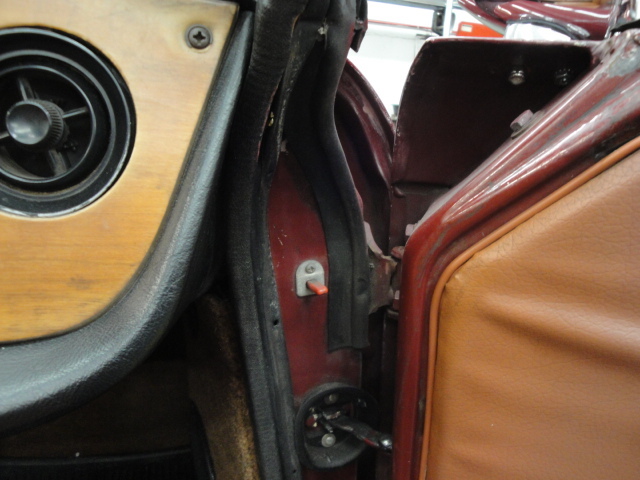 Does the correct “fuzzy” seal for a 1971 TR6 have a flap, not a bulb, right? I saw some from MacGregor British Parts that are quite nice! 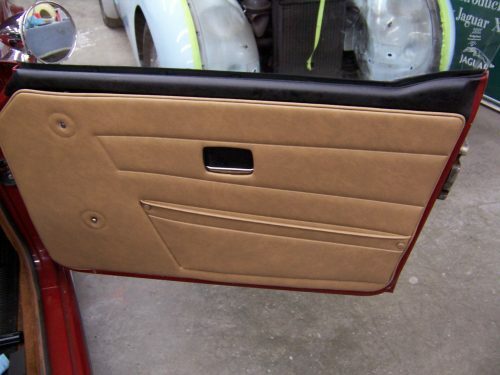 Sorry i’m late to this forem but i too have started rebuilding my doors on my 75 TR6. 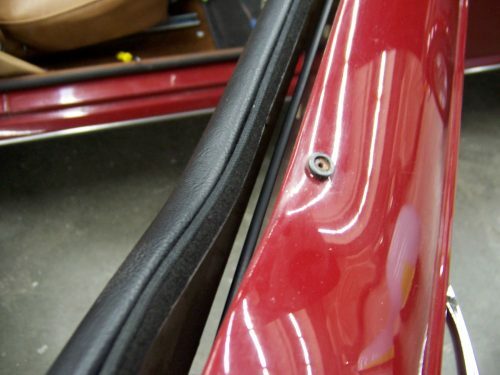 Would you please send me those photos about attaching the door glass seal to the windscreen frame. Thanks for your help. Gary.